It is part of our natural, physical makeup to have different sizes of hands. However, the size of hands that we have does not necessarily pose a hindrance to our passion to music. Whether we have big hands or small hands, if we really like to play a musical instrument, such as a guitar, we will find ways to be able to do so. One way in which we can accomplish this is by making sure that we find the best guitar for small hands. While we do not have full control over the way our physical body is designed, we have control over the things that we use in order to achieve the things that we want. The good news is that, there are a lot of options out there available. The only problem with having several options is that making a decision can become quite challenging. In order to filter out the best option, we need to take some factors into consideration. Later on, we will look into the top 5 best guitar for small hands, and make a decision based on the features presented. Now, let’s take a closer look at the top 5 best guitar for small hands. Take note of the features that are available in order to make a well-informed decision in the end. The Fender Kurt Cobain Jaguar NOS 3 can be considered as one of the best electric guitar for small hands. It has a solid body makeup, which is an exact replica of the famous guitar of Cobain. The body is constructed using alder, with its neck made of maple, fingerboard of rosewood, as well as an overall mix of tonewoods which provides you that iconic grunge of the 90s, still fit for a modern package. 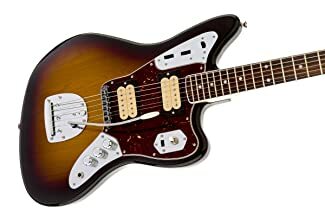 Technicality wise, the Jaguar is made with a vintage tremolo, two DiMarzio humbucker pickups, upgraded adjusto-matic bridge, DP103 PAF neck style, as well as a DP100 bridge super distortion. It also comes with a three stage control setup which utilizes knurled chrome knobs. Another thing that should be noted is its 4-ply brown shell pickguard with distinctive body shape, while its New Old Stock finish makes the vintage look complete. The accessories include an exclusive book that comes with photos as well as commentary given by Charles Peterson. This serves as an amazing guide to both beginners and seasoned guitarists. I love the fact that this guitar comes in left and right handed versions. Therefore, those with small hands, and play using their left hand, would find it comfortable to use. With its NOS finish, this model has attempted to stick faithfully to the iconic guitar. The Martin LXK2 Little Martin guitar is equipped with the standard dreadnought body and a high pressured and laminated Koa top, sides and top. As a laminated guitar, there is an assurance of durability, which is perfect especially for those who love to travel with their guitars. The purpose of the design of this guitar is to make the user feel comfortable, not worrying about scratches, damage, or crappy sound that comes out of it. This model is particularly low in bass, with bright, clear sound, and a warm tone which easily entertains its listeners. This is primarily designed for those with small hands as well. The Martin LXK2 Little Martin guitar is often referred to as the best. However, this is only so if it is used in the right purpose. If you have small hands, or planning to get one for a teenage friend, or a young person to use it, this is a very good option to consider. The line under Baby Taylor was designed primarily in order to meet the needs of different guitarists, especially focusing on those who have hands that are too small for a bigger acoustic guitar. This may also be introduced to younger users, including children and teenagers. 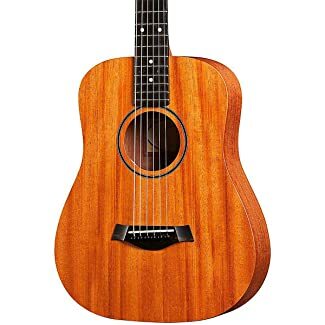 Similar with the rest of the other models under this brand, the output is a high-demand, high quality model, that is, the Taylor BT2 Baby Taylor guitar. Smaller sized guitars are fragile. However, this model is laminated in both back and sides, giving it extra durability. When removed out of the box, the Baby Taylor is amazingly beautiful, with its fret ends even, and absent of frets that are overly nicked or shaved. The hardware is suited accordingly to the size and shape of the guitar. While other guitarists do not like the laminated finish of most guitars, I find the BT2 Baby Taylor model durable because of that. While it feels a little bit artificial, it is less feeling so compared by others that are used by cheaper manufacturers. The varnish on its neck is soft and smooth, thus giving the wood a pleasant feel beneath the fingers. The Gibson SG Special is a model which has been in the music industry several years back, but has been recently updated to focus further on the early 70s models. It comes with a classic mini humbucker style pickup set as well as a unique finish which makes this guitar model a stand out compared to others. The body of this guitar uses an all-mahogany slim design which a thin neck that is topped with rosewood for its fretboard. Typically, this combination of wood use makes any guitar heavier, but when combined with a thin body and neck, this guitar still feels lighter compared to other guitars that are available today. When compared to a close competitor, Les Paul, the Gibson comes with a brighter sound overall, with a classic touch. This creates a sound that will allow musicians to have more freedom when playing on stage. For the price that this model is being offered, I would say that it is worth the purchase. If you are interested in a vintage inspired sound which is better compared to a bigger sized humbucker, this is the option to go. This is a result of the shorter spaces in between frets, as well as fewer winds which offers a more focused and tighter sound which is highly desirable. The Protégé C1 from Cordoba is a classical guitar. It comes with two size options: full size, or ¾. It was primarily designed for beginners, and also for those who have small hands who need something that is easy to work on the fingers. This model comes with a nylon string style that features a 615 mm (24.2” scale length). As a model that belongs to the Cordoba Protégé line, it is known to be a high quality instrument which is designed to offer aspiring guitarists with a comfortable guitar to start with. Aside from that, it is also designed for those with smaller hands who would like to play the guitar without the complications of bigger, full-sized options. With its classic combination of spruce tops as well as mahogany sides and back, rosewood fingerboards, bridges and mosaic rosette, this is certainly pleasant to look at. What I like about this model is that it is also designed for those with smaller hands who would like to play the guitar without the complications of bigger, full-sized options. With its classic combination of spruce tops as well as mahogany sides and back, rosewood fingerboards, bridges and mosaic rosette, this is certainly pleasant to look at. At this point, it is essential to acknowledge one fact: when you have small hands, learning how to play the guitar is a real challenge. As such, it is a great thing to know that the guitar market is filled with guitars that are designed primarily for individuals with smaller hands. This scale length is measured by multiplying by 2 the distance in between the first fret and the 12th fret. If the scale length ends up shorter, the distance between the first and the 12th fret is also shorter. This indicates a close distance between the frets, making it easier for small hands and fingers to reach between them. Neck widths vary depending on the guitar model. Getting a guitar with a narrower width can make it a whole lot easier to play. At the same time, there are some necks which are lower in profile compared to others. This means that the neck depth is not as deep as well. Searching a neck with a low and narrow profile may make playing easier for those who have smaller hands. Some experts recommend starting with the use of electric guitars first, as they have narrower neck widths and lower profile necks, and then eventually moving to an actual guitar once you have mastered it. If this is the option that you would like to take, you can also consider finding the best electric guitar for small hands. However, this might pose some challenges if you plan to play acoustic guitar later on. As such, it is better if you look for the best acoustic guitar for small hands early on. Regardless of the guitar that you will choose, it is very important to strengthen your fingers. If all possible, you can make your fingers easier to stretch, and stronger, so that you will not have a lot of issues with chords and fretting, even when using guitars that have a wider neck, or one with a full scale length. Indeed, finding the best guitar for small hands can be quite challenging, but with some help, it is not a hopeless case. Each of the items included in the list above come with their own set of advantages and disadvantages. If you also notice, some are of the electric category, while others are classic. This means that you have to take into consideration first the type of guitar that you would like to have. As previously mentioned, some recommend starting with an electric guitar, because it has a narrower neck, but others, however, recommend going straight to using an acoustic guitar, especially if you are planning to use one in the first place. Regardless of your choice, the models that are listed above will give you a glimpse of the features that you can expect. With the details provided, you can make a well-informed decision before purchasing.